Camille Granda, who has been a member of the Roundtable for about five years, will talk about The Civil War Through the Eyes of the Captive. She was inspired to research this subject by her compassion for the plight of the slaves. IF YOU HAVE NOT ALREADY DONE SO, PLEASE PAY YOUR DUES, OR YOU WILL NO LONGER RECEIVE THE NEWSLETTER. Dr. George Nimberg has graciously donated The Bachelder Papers, a three volume set of books concerning the Gettysburg campaign. There will be a special raffle for these mint condition books valued in excess of $150. One ticket will cost $5.00 or you may purchase three tickets for $10.00. Tickets will be sold at the April and May assembly and the winner will be drawn at the May assembly. The Round Table appreciates George’s gift. Are there other members who would like to donate valuable items relating to the Civil War? Our monthly raffle will continue. Any Civil War books in good condition will be greatly appreciated. If anyone wants to present a program, please call me or talk to me at an assembly. The Round Table wishes a speedy recovery to all of our recruits on the sick list. Snail mail is expensive and is soon going to get more expensive. Members willing to receive their newsletters by e.mail will reduce the Round Table’s expenses and speed up delivery. Members who wish to receive their newsletters electronically should call Bob Schuldenfrei at (561) 582-3340 or look him up at an assembly. Jo Crowell, a guest, said her husband had found a diary of a Confederate soldier named David Longacre several years ago. His brother, Thomas Crowell, has turned the diary into a novel entitled, “Cry Uncle, Somebody,” which has just been published. She had brought several copies which were for sale. William McEachern reminded us that the Annual Conference sponsored by the Civil War Trust (which raises money to preserve historic Civil War sites) will be held at Manassas, Virginia, May 19-22, 2011. The title of the Conference is “To the Gates of Washington: the Battles of Manassas.” Join Civil War Trust and staff, along with some of the nation’s elite historians, for four days of camaraderie and Civil War touring at some of America’s great Civil War battlefields in Manassas, Virginia. Finally, Howard Krizer provided the Roundtable with an invitation to “A Civil War Symposium,” at Shepherd University, Shepherdstown , West Virginia, June 4-5, 2011. 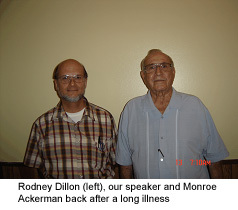 A long-time member of the Roundtable, Rodney Dillon said he was distant relative of one Moses Low, born about 1830 in Boston, Kentucky. His family migrated first to Indiana and finally to Illinois. By 1852, Moses was 22 and on his own working as a farm laborer and boarding with the Loftus Family in Lick Creek, Sangamon County. He ran with a “rough” crowd and quarreled with one James Gray, a son of a prominent family, who had accused him of only “fighting boys less than me.” They agreed to meet at the Mouth of the Lane, opposite the Nippers farm, at 7 A. M., August 30, 1852. In 1852, Abraham Lincoln, a former legislator and one-term Congressman, was concentrating on his law practice. He and William Herndon worked out of a building on the square in downtown Springfield. Dillon is not sure how it happened, but Lincoln agrees or is assigned to represent Low. His fee, if any, is unknown. Lincoln immediately files a plea of “not guilty in manner and form charged.” He tries to get the charge reduced and petitioned for a change in venue, referring to the fact that Gray’s family is “prominent” in the county and that the newspaper articles are highly prejudicial. The judge, who knew Lincoln well after traveling the 8th Circuit in spring and fall with him and other attorneys for several years, moves the trial to Dewitt County. Low is moved to the jail in Clinton on October 7. Around this time, David Davis, the judge who would conduct the trial, wrote a letter to a friend. After discussing numerous other topics, the letter includes the following: “In Dewitt (by change of venue from Sangamon)--a young man is under indictment for murder. The case may be continued til next spring on account of the absence of a witness. I am afraid it is a clear case of murder. The man indicted waylaid the deceased and literally cut his throat. He bled to death in five minutes--an old grudge between them.” The prosecution lists eight witnesses. Lincoln moved successfully to put over the trial until May 1853, giving him time to locate witnesses for the defense. Low is returned to jail in Springfield. Lincoln locates Thomas Blankenship, who would testify that Gray told him that Gray and Low had made an appointment to fight (countering the allegation that Low “waylaid” Gray) and Elizabeth Grass, who would testify that she was present when Low told her sister, Mary Grass he had bought the knife to defend himself against Thomas Lacy, who had threatened him (countering Mary’s testimony that Low had purchased the knife to “use it” on Gray). The trial runs for three days, May 16-18, 1853. Benjamin Morris testified that Gray had asked him to ride to Springfield to attend court and saw Low with a knife. On cross, Morris admitted that Gray had told him that he was going to fight with Low. William Nipper testified that he saw Low early in the morning, then heard loud voices. He witnessed the fight. Almira Jane Nipper said she also saw Low and heard loud voices but did not witness the fight. Defense witness Thomas Blankenship testified that Gray had asked him if he wanted “to see some fun,” telling him about the planned fight. A Doctor testified that the blood from Gray’s mouth was not from the knife. The jury’s verdict was manslaughter and Low was sentenced to 8 years in the state penitentiary in Alton, Illinois. The first three months would be in solitary confinement and the rest of his sentence would be at hard labor. Low proved to be a “model” prisoner. On August 18, 1857, Lincoln submitted a petition for pardon, with affidavits signed by the citizens of Morgan County (where Low’s brother lived) and Sangamon County and by the jurors who had heard the case (one of whom was Richard Yates, future governor of Illinois)! Lincoln’s petition portrayed Low as an “exemplary” prisoner and pointed out this was his first offense. Low was pardoned. Another reason for the pardon may have been the Panic of 1857, which caused the county to be short of funds for caring for prisoners. 1858 brings the Lincoln-Douglas debates, launching Lincoln’s road to the White House. Low settles in Bainbridge, Schuyler County, Illinois, marries Charlotte Jane Wardell on October 30, 1859. Their first child, Mary Elizabeth is born September 18, 1861. Moses’ father, W. A., and brother Fielding, enlist in 1861. 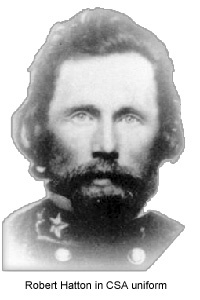 W. A. is captured at Shiloh and dies after catching pneumonia and being exchanged. Following their lead, Moses enlists for three years in Company F, 103rd Illinois, on August 12, 1862. Moses is assigned to McPherson’s 13th Corps and spends the fall, winter and spring of 1863 in Northern Mississippi and Western Tennessee in support of the Vicksburg campaign. On May 1, 1863, he participates in the capture of Sol Street’s Confederate guerrillas. At home, his daughter, Anna Augusta, is born May 15, 1863. In the summer of 1863, Moses joins Parks’ 9th Corps guarding the rear approaches to Vicksburg against Joe Johnston. He helps occupy Jackson, Mississippi on July 16 and in October is sent to Northern Alabama. On November 24, 1863, he is part of the attack on the Northern end of Missionary Ridge. Participates in the fruitless effort to relieve Burnside in Knoxville and spends the winter in Scottsboro, Alabama. Between May 1 and July 22, Moses is in the front line all but three days! Moses is wounded on July 22 and dies on July 23, and is buried in Marietta National Cemetery. 2 If “cotton diplomacy” had succeeded in obtaining recognition from England and France. The Emancipation Proclamation and Northern victories shut that door. 3 Summer to fall 1864 – Lincoln’s defeat was “likely” with Grant bogged down outside Petersburg with huge casualties and Sherman was finding it slow and expensive in lives on the road to Atlanta. The fall of Atlanta assured Lincoln’s reelection. Postscript: Charlotte receives a widow’s pension and John C. Bagby, of Rushville, Illinois, an associate of Lincoln, is appointed guardian to pursue an orphan’s pension for Moses’ two children, Anna Augusta and Mary Elizabeth. Charlotte marries James H. Bridgewater (a Civil War veteran) on November 11, 1866. They had nine children. In 1880, they moved to Kansas and later to Alma, Nebraska. Charlotte dies October 17, 1908. Anna Augusta dies of measles May 15, 1882, on her 19th birthday on the eve of her marriage and is buried in her wedding dress. May Elizabeth married Henry White on November 19,1882, and lived until 1921, leaving numerous descendants of Moses Low living today. Dillon received a warm round of applause for a story well told! The New York Times has instituted a “blog center” entitled, “opinionator.blogs.nytimes.com” which will contain various articles by noted historians and academics. A good example of an article showing that the “Upper South” was not “hell-bent” for secession follows. The author is a professor at the College of New Jersey and author of “A Secession Crisis Enigma: William Henry Hurlburt and ‘The Diary of a Public Man.’” The editor thanks Howard Krizer for alerting him to this resource. The featureless flat plains of West Tennessee seemed an unlikely locale to harbor a “Southern Black Republican.” But his political opponents routinely hung this epithet — and worse — on Rep. Emerson Etheridge. That’s because, unlike many Southern antisecessionists in early 1861, Etheridge continued to proclaim unconditional loyalty to the Union. Even worse, he ridiculed the idea that the Republican Party intended to interfere with slavery. Secessionists and Southern Rights supporters sputtered in frustration. Etheridge, they said, had fallen into “the depths of disgrace and infamy.” He appealed only to the “ignorant and blind lick-spittles” rather than to “the slaveholding and enlightened portion of the people.” A 40-something widower with two young daughters, Etheridge had an easy charisma and a compelling speaking voice. His young colleague, Robert Hatton, newly elected to represent an adjacent district, quickly developed a fast friendship with Etheridge. “If he was a woman,” Hatton gushed to his wife, Sophia Hatton, “you would be certain we were dead in love with each other. . . . We eat together, walk to and from the Capitol together, sit in the House together, room by each other, [and] are alike in politics, in religion, and our feelings and sympathies.” Both stubbornly shunned alcohol and the other vices of Washington life. Etheridge’s personality and oratorical power made him a natural leader of the close to two dozen members of the House of Representatives who called themselves the “Southern Opposition.” All were former Whigs, almost all from the Upper South. The opposition bloc held the balance of power in the House, which was closely divided between Republicans and Democrats. And they used that influence during the first few months of 1861 to keep the Upper South from seceding – a fact that explodes any notion of the white South as a unified region hell-bent on leaving the Union. Etheridge made one of his most important speeches against secession on the floor of the House on Wednesday, January 23, 1861. He charged that secessionists had fabricated a mass delusion: “Thousands believe honestly that Lincoln and his cohorts are coming down to apply the torch and the knife to the dwellings and people of the South.” But that was just baseless hysteria, he said; Republicans had already renounced “any desire or any power to interfere with slavery in the States of this Union.” He scorned the idea that the South needed to expand slavery to the territories, or that the North had defaulted on its obligation to return fugitive slaves. The evils that secessionists pretended to fear were flimsy or imaginary. Just then a thin, reedy voice demanded, “I merely wish to know whether the gentleman is speaking on the side of the North or the South?” The interruption came from Shelton Leake, a Virginia disunionist. Etheridge shot back immediately: “I am speaking on a side that has few representatives on this floor. I am speaking on the side of my country!” A reporter for the Cincinnati Commercial described Etheridge’s retort as a “clincher”—“The noble, exalted tone and emphasis in which this was uttered, rang through the hall.” A resounding applause rang through the galleries. But no Republican could countenance Kentucky Sen. John J. Crittenden’s insidious formula. To do so might open the door to a slave empire in the Caribbean and Central America — and much more immediately, they feared, it would tear apart the Republican party. Conciliatory Republicans instead offered to admit all existing territory south of 36° 30́ into the Union as the slave state of New Mexico, and to amend the Constitution to forbid interference with slavery in the states where it already existed. Abraham Lincoln passed word that he could live with these concessions — and so did some Southern Unionists. Forget about “hereafter acquired,” they suggested. Give us New Mexico and the constitutional amendment, and we can hold the Upper South. Voters in the Upper South had their say in February 1861. In state after state, starting with Virginia on February 4, emphatic popular majorities opposed secession. This outcome resulted in part from a massive mailing of pro-Union speeches. Night after night, Hatton reported to his wife, he and other Southern Unionists in Congress stayed up late franking thousands of copies of their oratory for free postal delivery. When given the opportunity to do so, voters in North Carolina and Tennessee even opposed letting a state convention meet. But Unionist victories were conditional, based on the assumption that Republicans would offer concessions and, most of all, that the incoming administration would not use armed force against the Deep South. When Lincoln took his oath of office on March 4, eight slave states, home to two-thirds of white Southerners, remained in the Union. An uneasy peace prevailed. 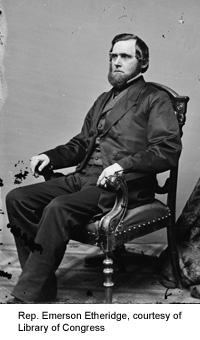 Tennessee Congressman Horace Maynard beseeched Republicans to act cautiously. “Believe me,” he pleaded, “the moment you wage war, you array the entire South, as one man, in behalf of the portion that is attacked. It is as when a brother is assailed, all his brethren rush to his rescue, not stopping to inquire whether, in the contest, he be right or wrong.” Maynard exaggerated. His home region of East Tennessee would not follow the secessionist lead once the war started, and Maynard himself ended up an unconditional Unionist and a Republican. But Maynard, on balance, knew much about how the future would unfold. Of course, when push came to shove in the Upper South, and its citizens no longer could avoid the dread matter of choosing sides in a war, slavery did much to determine the outcome. Though Arkansas, Tennessee, North Carolina and Virginia all seceded, regions with few slaves resisted. Although Emerson Etheridge owned 10 slaves, most of the voters in his district owned none. He stayed loyal to the Union and many of his constituents volunteered for the Union Army. But regions with more substantial slaveholdings — even Whig-Opposition enclaves that had stoutly resisted secession before mid-April — suddenly gave way and embraced the Confederacy. On the other hand, Robert Hatton represented part of the fertile Cumberland Basin, where many families held slaves. Seventeen men, women and children were listed as his property on the slave schedule of the 1860 census. Notwithstanding Hatton’s pre-war Unionism, he volunteered to organize a regiment for the Confederate army and was promoted to command a brigade. On the last day of May 1862, at the battle of Seven Pines east of Richmond, Va., General Hatton was instantly killed by enemy fire while leading his troops across an open field. Henry Wadsworth Longfellow published ‘Paul Revere’s Ride,’ 150 years ago tomorrow – the same day that South Carolina seceded from the United States. ‘Listen my children, and you shall hear / Of the midnight ride of Paul Revere.’ Before Longfellow published these lines, Revere was never known for his ride, and Longfellow got almost every detail of what happened in 1775 wrong. 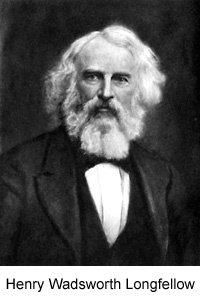 But Longfellow didn’t care: he was writing as much about the coming war as about the one that had come before. ‘Paul Revere’s Ride’ is less a poem about the Revolutionary War than about the impending Civil War – and about the conflict over slavery that caused it. That meaning, though, has been almost entirely forgotten. Yet, Longfellow’s abolitionist zeal didn’t abate. He secretly spent money he earned from his best-selling poems, like ‘The Song of Hiawatha,’ to buy slaves their freedom. In 1856, when Sumner gave his famous ‘Crime Against Kansas’ speech in the Senate, Longfellow congratulated him: ‘At last the spirit of the North is aroused.’ That speech nearly cost Sumner his life – it so incensed a South Carolina representative, Preston Brooks, that he beat Sumner with a cane on the Senate floor. 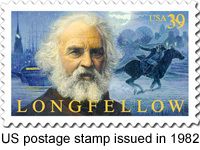 Thanks to poems like ‘Paul Revere’s Ride,’ Longfellow was once the country’s most respected and beloved poet. But, beginning with the rise of New Criticism in the early 20th century, literary scholars have dismissed his poetry as cloying, drippy and even childish. Generations of schoolchildren have memorized ‘Paul Revere’s Ride’; critics have barely read it. With the history of the poem forgotten, this became all-purpose stuff. ‘We still need some Paul Revere of conscience to alert every hamlet and every village of America that revolution is still at hand,’ the Rev. Dr. Martin Luther King, Jr., said in 1967. In 1971, the Vietnam Veterans against the War marched Revere’s ride in reverse. . . . This year George Pataki came to Boston to unveil an organization called ‘Revere America’: ‘We’re here today to tell the people of America,’ he declared, ‘that once again our freedom is in danger’ . . . from health care.